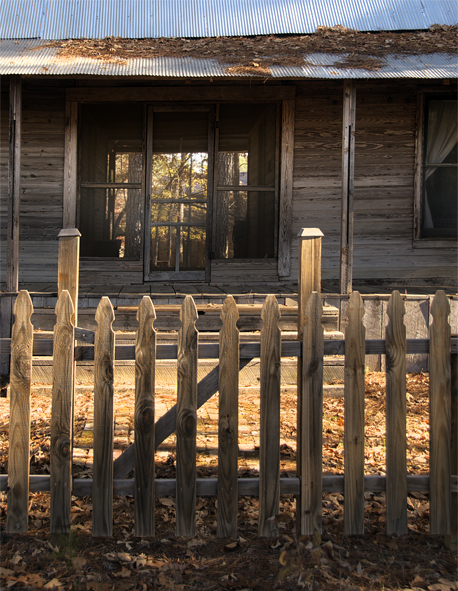 Until spring of 2010, this old home was in shambles, 47 miles or so to the west of where it now sits on Pumpkin Hill Road southeast of Rison, Arkansas enjoying early morning sun in mid-November. The old structure is the former home of Bob Abbott’s grandfather. Bob thought the old home was worth saving. So he did. 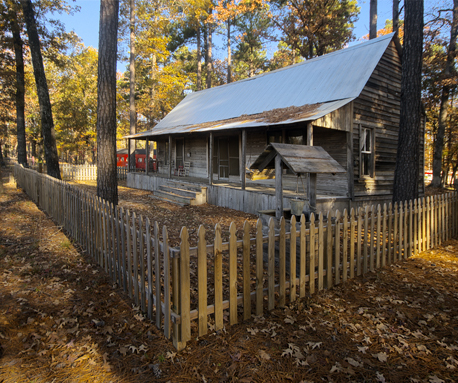 In 2010, Bob Abbott decided it was high time to move his grandfather’s old dogtrot house from Smead, Arkansas to his place on Pumpkin Hill Road southeast of Rison, Arkansas. 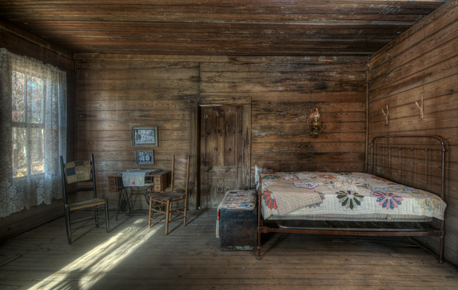 The old house had been in its original location since the late 1800s and was no longer owned by the family. It was not in good condition. 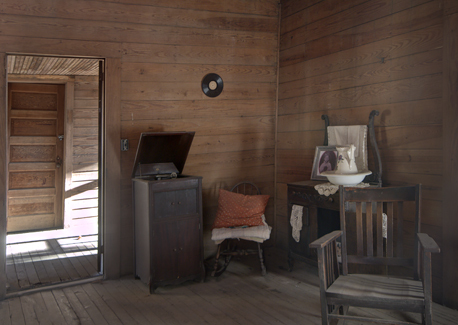 In fact, Bob was told by many that the old house was well past restoration and that the move was a bad idea. Bob disagreed and finally found an individual who agreed with his disagreement. He made a deal with the current owners and the move was on. Click on the house for more pictures and info. After come careful jacking and loading, the old house was on a trailer and ready to roll. The trip from Smead to Pumpkin Hill Road was in the neighborhood of 47 miles, mainly over back county roads and secondary state highways. See some details of the pre-load condition of the house in our earlier story: The Old House at Smead. Fortunately the trip was reasonably uneventful and the moving crew safely delivered the ancient cargo to the Pumpkin Hill location. Then the real fun began: Reassembling a house without all its parts. Some parts were simply beyond salvage and the builders had to substitute newer materials and make them fit. Before we go too much further. may we suggest that you check out the start of this story on the Photo of the Week page at Corndancer dot-com. You’ll see more pictures and get additional information. 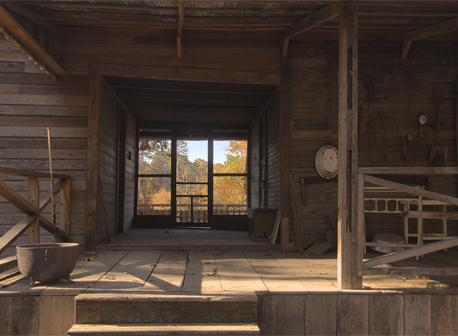 You are looking down the dogtrot breezeway from the front of the house. The kitchen side is to the right. The bedroom is to the left. This is close to the original structure of the home. 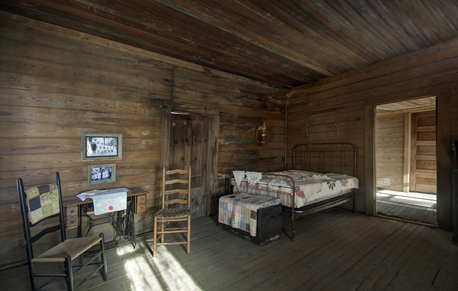 In later years, the homeowners closed the dogtrot at both ends and made a big central room. This was a common practice as families grew, an early no-brainer for a quick room addition. Here’s a 180, looking at the dog-trot breezeway from the back porch. 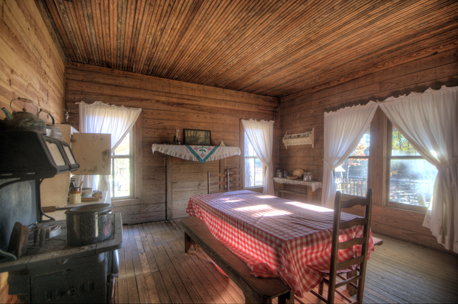 Dogtrot houses in their basic form have two rooms separated by a breezeway. 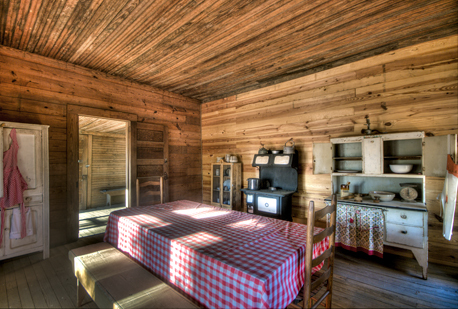 One side has sleeping and “living” quarters, the other side has a kitchen and dining area. 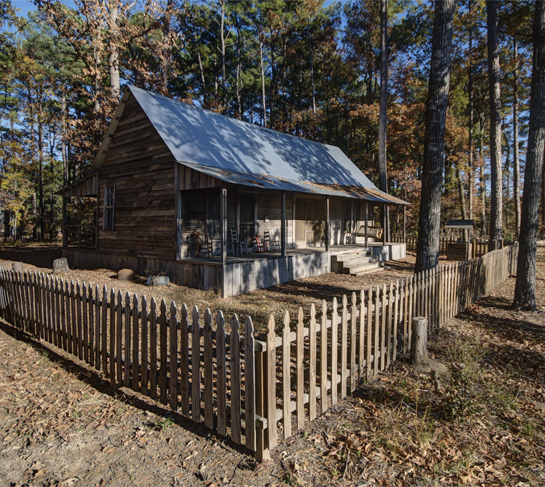 In almost all dogtrot houses, the family eventually made additions to the structure. This one is the two-room version. This is the bedroom complete with iron bed, ladder-back chairs and a vintage Singer Sewing Machine. There are two windows, one to the photographer’s back and the one you see to the left. There is also a door to the back porch. The walls, ceiling and floor are original equipment. Looking at the bedroom from the front corner showing the entrance door from the breezeway. The wide angle lens necessary to capture this image has distorted the door to nearly twice its size. The home entertainment corner of the bedroom consisting of a 78-rpm Victrola and a couple of chairs. The dresser has a picture and wash bowl. 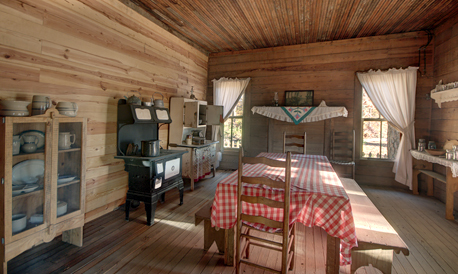 The kitchen has the expected cast-iron stove, a table – and chairs for mom and dad – and benches for everyone else. For ultimate convenience of the times there’s also a sink, pantry, and cupboard. The kitchen from a slightly different angle. Another view of the kitchen. This time with hanging aprons. Nice touch. Here’s one more look from the front in mid-afternoon sun. 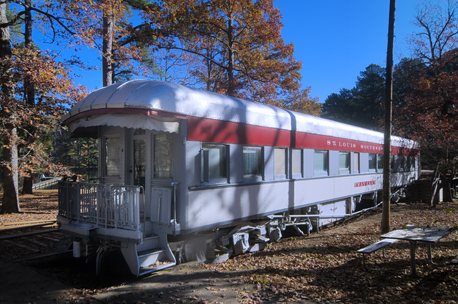 We’ve visited Bob Abbott’s place on Pumpkin Hill Road before, but for those of you who are not familiar with the place, you’ll also find The Traveler, a fully restored and working (but not rolling) executive rail car from a bygone era. You can learn more on The Traveler in our original Corndancer story, Traveler’s Rest and our Weekly Grist version of Traveler’s Rest. The Traveler was once the private car of the president of the former St. Louis and Southwestern Railroad, known popularly as the “Cotton Belt” line. 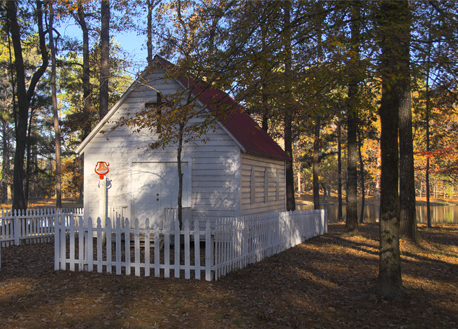 There’s also a Chapel on the property, popular for small weddings, memorial services, and other church meetings and events. 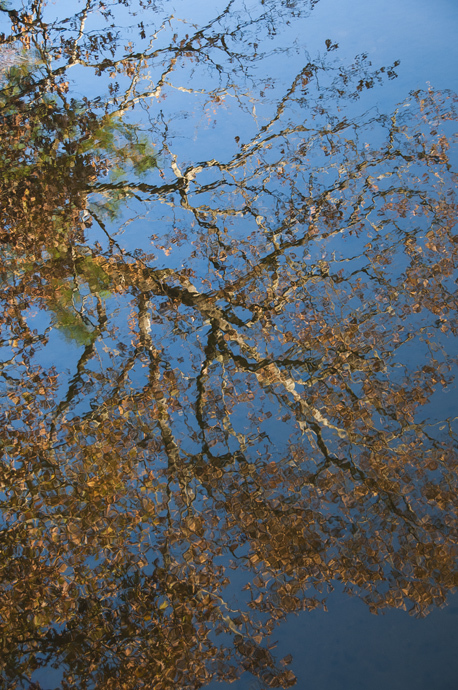 This tree-top reflection in a lake on the Pumpkin Hill Road place looks akin to any number of French impressionist works. And as a parting shot, there’s a fine lake on the property. I saw a tree-top reflection in the water. It’s the Almighty’s version of French impressionists made available to me. And to you. We have created a special gallery of 19 pictures of the place on Pumpkin Hill Road which are larger and better resolution than normal web presentation. If you would like to see the Pumpkin Hill Corndancer and Weekly Grist pictures larger and in greater detail this gallery is for you. Click here. I made this shot in May, 2010, so I believe we can safely assume the old house has lost it’s struggle with gravity and has taken the big dive. Click on the picture for the original post. For reasons I have yet to decipher, the original “There goes the neighborhood” post of May 2, 2010 is the second most re-visited article at Weekly Grist for the Eyes and Mind, so I’m sending you back to that post this week. The subject is a collapsing house which I’m certain has now made the final dive — along with some storm shots from a disturbance that cropped up while I was on the trip. Click here for the original post. As I listened to storm reports on the radio, I heard the words you do not want to hear, informing me that the brunt of the action was headed in the direction of my home. A quick call home allayed my worst fears. All was fine. See more on this story, click the tree. The story started when I spotted a “Home-place” tree — a tree left standing when humans abandon a home and the elements later dispatch the structure. You can find that story and a couple of pictures on the Photo of the Week page at Corndancer dot-com. There’s not another like it. 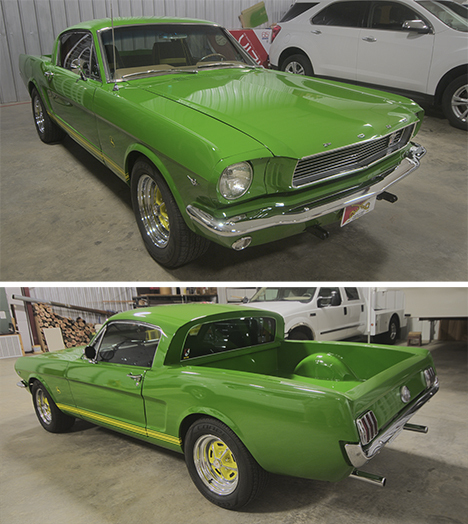 A ’66 Mustang, restored to pristine condition, painted John Deere green, converted to a pickup, and adorned with John Deere yellow stripes and a John Deere decal. This magnificent combination of two iconic American symbols is the creation of James Matthews of Rosebud, Arkansas. He also has a few hundred other Mustangs, not in quite as good condition as this one. The Ford Mustang was let out of the corral by Lee Iaccoca and his crew of Ford firebrands in April of 1964. Some called the new car a 64-and-half. Ford called it a ’65. Ford historians tell us with some authority that the Mustang was the automaker’s most successful launch since the 1928 Model A, introduced some 36 years earlier in October of 1927. The Mustang gathered a near-cult following which is alive and well today. With that sort of popularity, there are opportunities for enterprises other than the manufacturer to make a good living. James Matthews of Rosebud, Arkansas is one of those individuals. 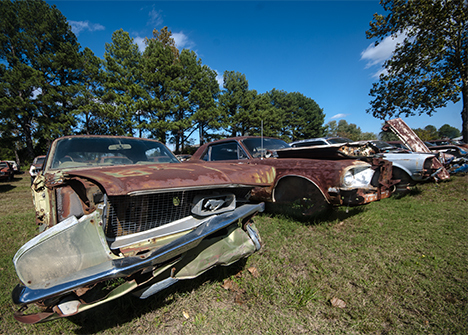 He recognized the Mustang potential in the early seventies when he started to accumulate wrecked Mustangs. Before we go much further, we recommend that you go to the Photo of the Week Page of Corndancer dot-com and get in on the beginning of this story. You’ll see more pictures of the truck and a well organized collection of Mustang carcasses. 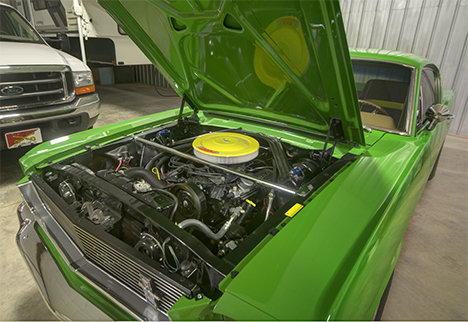 James Matthews did all of the work on the restoration except for the paint and body, and upholstery. He assures me that this engine is completely restored to original condition. It is perfectly clean with no leaks, spots, drips, or other obnoxious defects. The engine is as it should be, a ’66 Cobra. I did not get to hear it crank up, but I suspect the sound would raise the hair on the back of my neck. Here, it was necessary for some creative “southern” engineering to make a car passenger compartment into a truck passenger compartment. It looks like what they did worked well. 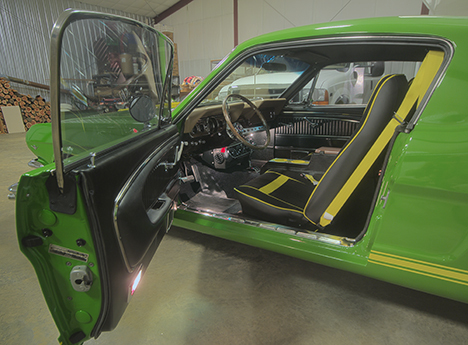 The interior generally follows the John Deere mantra and looks to be imbued with proper creature comfort for a good ol’ boy’s derriere. 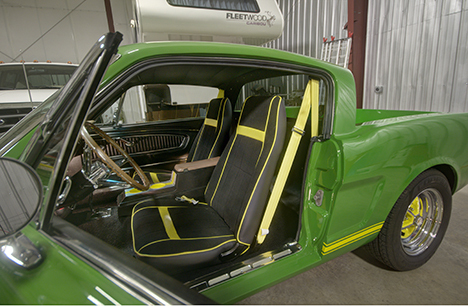 The door and dashboard are ’66 all the way. Even the radio is original. Back in 66, it probably belted out “The Ballad of the Green Berets,” “Winchester Cathedral,” and “Cherish,” the number one, two, and three songs of the year in that order. In 1968, Ford Motor Company had their advertising staff and agency create a new campaign, “Mustang Makes it Happen.” The signature piece of that promotion was a song of that title which was used as background music for radio and television commercials. The campaign and music are considered classics by most advertising people. Click below to hear it. The video runs nearly three minutes. The music has a strong five-string banjo track. It appears to target people who may want to escape a middle age crisis, a somewhat different approach from what we see today unless the ads are for fiber supplements, facelifts, or stool softeners. Also in 1968, the movie “Bullitt” featured the late Steve McQueen in a ’68 Mustang 390 Cobra versus a ’68 Dodge R/T 440 full of bad guys. A lot of people, including yours truly, believe this car chase scene is the one by which others are measured. In deference to the “French Connection” car chase fans, I acknowledge that there is an argument both ways. The “Bullitt” chase sequence ran just over seven minutes. The clip below gets the meat of the coconut and only takes up a tad over three minutes of your precious time. 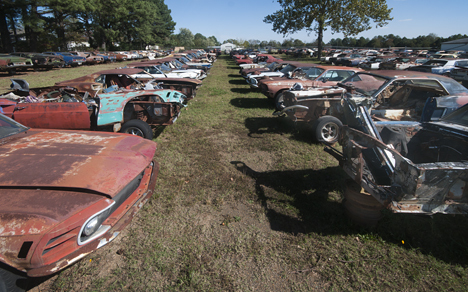 Somehow the terms “wrecking yard,” and “junk yard” just don’t seem to fit James Matthews collection of Mustang carcasses. The premises is as clean and well-tended as the White House lawn. The cars are lined up with military precision. All cars are off the ground. While the weather is not kind and ferrous oxide (that’s rust y’all) is running rampant in the yard, there is still value on the ground. And lots of nostalgia. Click here to see a panoramic shot of the entire collection premises. It is as if a drill sergeant had given the command, “Mustangs, Dress Right, Dress.” For those of you not familiar with military commands, that is the command that tells the troops to line up. This is typical of the entire premises which is clean and well-ordered. As you stroll through the collections, you can hear throaty exhaust, and peeling rubber. Unfortunately, you also think of “did they make it ?” A touch of realty tempers sweet nostalgia. Sometimes you just open your eyes and get lucky. I know. That’s what happened to me when I met James Matthews. Maggie, the resident Border Collie at L.M. Phillips General Merchandise in Fountain Hill, Arkansas, takes a long look at the front door of the store. Is she pondering the sign or checking out an approaching human? Regardless, she is on her A-game. Click on the picture to see our original July, 2009 post. Click on the picture for more on Margaret and Maggie. Back in July of 2009, I discovered L.M. Phillips General Merchandise at Fountain Hill, Arkansas, one of the few real, live, general stores still alive and well. The Saturday afternoon I was there, the proprietress, Margaret Phillips was doing a brisk business. Part of her business model is Maggie, a precocious Border Collie who believes her job is to look out for Margaret’s personal safety and to be an alarm system who raises the alarm when suspected interlopers show up. We are sending you back to Fountain Hill this week for a second look at the story of Margaret and Maggie. You will also see John Cruce and his team of mules pulling a wagon, something you don’t bump into every day. You will also want to see our original Corndancer dot-com Photo of the Week page with more pictures and a story.